Get in line now for Star Wars Galaxy’s Edge! The end of the line for Star Wars Galaxy's Edge is where? Epcot is dead, long live Epcot! No more trains at Walt Disney World! Chris can’t hear the WDW Railroad trains anymore! First episode of the new year! It’s been a while… Sorry everyone! Spaceship Earth closing? No problem! We'll be on the Disney Cruise! Glenn booked a cruise out of New Orleans! Disney Rumor show! Go Away Green! Disney Cruise Line will sail out of New Orleans in February, 2020! During Mardi Gras! Episode 053 - Why is Chicken Guy! on my coffee mug? Follow-up: Any updates on the Malefifire? What bugs Chris about Hollywood Studios? The name of our audience? The Rocketeers! Was it better before FP, in the olden days? Episode 044 - ParkLeap to the Backside of Tomorrowland! 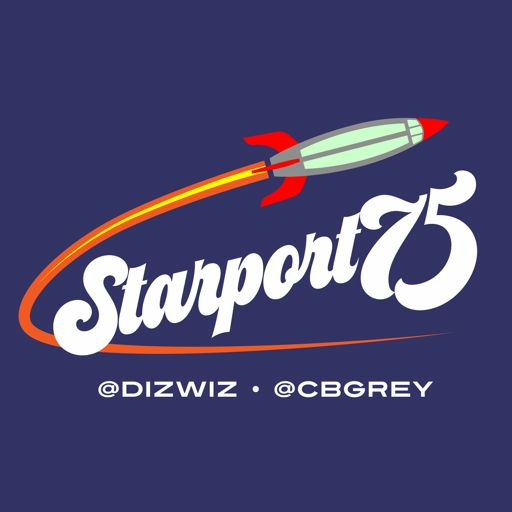 Episode 037 - The New Starport75 Podcast! Episode 036 - Dole Whips, Casey's Corner, Fastpass, Epcot's 35th, and the first "Stump Glenn"
Episode 034 - The Kaleidoscope, Storyverse, Hyperia, Beyond, Cinemagic, Legends, XL, Cinemagine Episode! Episode - 028 - Stupid Judy! Where's Ellen? Oh, she's listening to The Beatles. Hall of Presidents - what’s happening with it? Chris had a houseguest: Glenn! Episode 006 - Jingle Bell, Jingle BAM! Episode 001 - If the Earful Tower falls in the backlot and no one is around to hear it, does it make a sound?